The doctor has spoken. But it's not the kind of doctor you were thinking. It's "doctor government" and now the state is continuing the dialogue which was introduced in 2015 for the first time. Most Americans probably didn't even catch the new odd rhetoric introduced then, attempting to link "global warming" to actual medical diseases and human health. For a while I thought it was a bad idea that went sour and I thought we wouldn't hear about it again but I was wrong. It's back! It is clear now that this is an agenda they will continue feeding into moving forward. 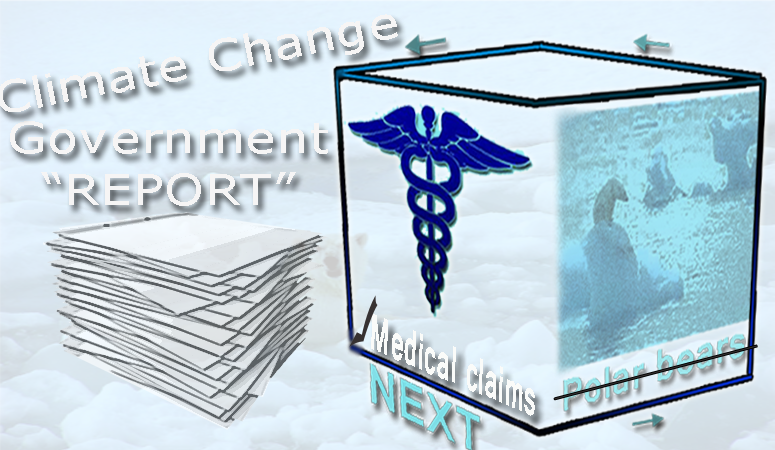 The Obama administration and his mainstream media weapons of mass deception are unleashing a fresh new round of fear on the American public, this time claiming that medical health will only get "much worse" as a result of "global warming". Yes, you read this correctly. Everyone will soon be getting ill because of global warming! In other words global warming is back for another round with each round getting more and more fascinating. Global warming could lead to an increase in allergies and asthma, deaths by extreme heat and the proliferation of insect-borne diseases such as the West Nile virus, according to a scientific report released Monday by the White House. The conclusions of the report on the health effects of climate change in the United States are not new. But Obama administration health officials, including Dr. Vivek H. Murthy, the surgeon general, said the study, which was reviewed by the National Academies of Science, offered the strongest evidence to date that links climate change to health risks. In the "government report" we're told that things like "extreme events", "temperature-related deaths" "water related illnesses" and "vector-born diseases" are among the problems humanity faces due to global warming. The state speaks as if living on earth is a new thing and we must now learn how to somehow do it right. They speak as if nature doesn't know what it's doing and only we the tiny little people control it's balance like a machine in need of help. This is the new global delusional narrative being fostered by the ruling elite and their global agenda. In order to believe all of this however, you must ignore everything about our planet, including the balance of the earth and nature's self-preserving capacity. In order to believe this it's also important to not believe in any god or universal order. It's important to think that everything is absolutely random and we are alive by accident. This is taking a page right out of the "Malthusian Catastrophe" doctrine of scarcity, overpopulation and end of the world claims which make up the core principles of the global warming-climate change movement. This 'planet-worship-people-blaming' ideology perfectly appeals to mostly the left as warm, logical and even righteous because it involves partial truth. Why wouldn't we want to cut pollution and strive for a clean planet? But at what cost? And if we care so much about the planet why don't we hear anyone mentioning even once how the state funds the systematic spraying of the skies covering blue skies white on a regular bases? Isn't that a climate issue too? So apparently CO2 (a natural and necessary compound) is somehow bad for the planet but spraying a soup of toxic metal particles is okay? Or even worse, just "conspiracy"? One thing everyone should remember is that this agenda which puts little humans in charge of and responsible for the planet instead of letting the planet thrive on its own is a key to controlling all of humanity. In this model the planet itself doesn't know what it's doing. The greatest global fertilizing nutrient CO2 itself is the boogeyman, and humans must be stopped, taxed and controlled (conveniently) in order to prevent or contain the emission of the CO2 "poison" molecule that we are all breathing. How convenient for the ruling elite. This much is clear looking at the ruling elite's agenda. Fear must never end in order for the ruling them to maintain their power. These are the rules which apparently must be heeded to in order for the global agenda to continue. I'm talking about the United Nation's Agenda of global "sustainability", global "peace and prosperity" and global "unity" all requiring lots of taxation of the people, lots of monitoring of all human activity, and lots of global policing to make sure everyone is cooperating. Unfortunately most people don't see that the only way to get this agenda done is through fear. So if there is one thing in this life we can all count on, it's the continuation of fear issued out by the state as they are doing here. The release of the report, titled “The Impacts of Climate Change on Human Health in the United States: A Scientific Assessment,” was timed to coincide with National Public Health Week, and with public relations efforts to bolster support for the Obama administration’s embattled climate change policies. The fact is that Obama's climate change agenda is being broadly questioned by many nations worldwide as they observe the pseudo-science put out combined with the global money jar as climate regulations translate into mandatory taxes. With numerous countries catching on to the whole political motives and the lies behind the Al Gore global warming claims many are hesitating to be a part of the scheme. That is forcing the UN and Obama to push the politics and timing of this any way they can, a potential sign that they are desperate. The United Nations secretary general, Ban Ki-moon, has invited world leaders to New York on April 22, Earth Day, to formally sign the deal, but some climate diplomats fear that with the United States plan in legal limbo, other countries may hesitate. Last week, Mr. Obama and President Xi Jinping of China pledged that their two countries would sign the deal on Earth Day in a bid to bring other countries to the table. Will other countries jump into this stupidity and propaganda based on government pseudo-science? Only time will tell. More deaths from extreme heat. Longer allergy seasons. Increasingly polluted air and water. Diseases transmitted by mosquitoes and ticks spreading farther and faster. Those are among the health risks that could be exacerbated by global warming coming decades, the Obama administration warned in a new report Monday. The recent propaganda campaign doesn't end there. The Associated Press jumped in on the psyop claiming that global warming is "making us sick" and worse than that, global warming is even apparently affecting mental health! Environmental Protection Agency chief Gina McCarthy said if that's not enough, climate change affects people's mental health, too. "It's not just about polar bears and melting ice caps. It's about our families. It's about our future," McCarthy said at a White House event unveiling the report. Climate change affects more people in more ways than anything doctors have seen in the past, said Surgeon General Vivek Murthy. He said the report allows doctors to better quantify "the sheer number of pathways through which climate affects health." We must all continue to take a stand against this level of state sponsored propaganda constantly looking for new ways to scare us and continually creating brand new fabricated fears just so they can carry out their agenda. Understanding this dialectic truly is at the heart of stopping the new world order and turning our own lives around for the better. We can't stop ignorant people, blind followers and mindless sheep from believing these lies and made up fears, but we can look for solutions. The first solution we need is a quick and easy way to counter their lies and propaganda. That starts with information. We must create solutions for a better world that involves freedom FROM the state. I want to live in a "sustainable" clean world that involves a small or even no government at all. How about that for sustainability? What about sustaining our freedom and our liberties? Doesn't freedom and liberty go hand in hand with health, a clean planet, sustainability, and prosperity? Let's ask ourselves questions like- why have we allowed the controllers to steal so much of our vocabulary for their purpose? Why does prosperity, peace, fresh air, and sustainability have to be tied to tyranny, a global ruling state, lack of freedom, over-the-top surveillance, a violent police state and mass taxation theft of all humanity?? How is that attractive to humanity? It's not and unfortunately too many people can't seem to separate the two concepts. Anything that empowers the state is tyranny and fascism whether it's tied to "sustainability" or not. More than ever we must all value personal freedom more than the very air we breath. There are no medical problems related to climate change because the climate is supposed to change. Humanity has survived every kind of weather extreme throughout history and it will continue to live through all changes with one ironic exception; the global cooling they are causing by tampering with the weather and the planet every day when they spray the skies. Potentially another ice age could destroy much of the earth. Put a trap on it and stay out of medicine. The human immune system when left alone without the toxins and toxic metals we are exposed to daily works very well. Stop trying to play god and control life. Stop imagining that we are all afraid of death and that the state must somehow "save" us from these potential causes of death as if the state cares so much about us. We see right through you and your intentions. This game is as old as time. Those of us awakened are sick of your games and we will do whatever it takes to stop or sabotage your agenda of control. Eat healthy. Watch the series titled 'The Truth About Cancer' replaying April 12, 2016. Learn about the real threats to human health which have nothing to do with global warming. Learn the basics about your body and your immune system. You control your health not some abstract out-of-control government spewing propaganda and lies to control you. Remember you are what you eat. Stop eating anything that is not organic. Eat only non-GMO foods for starters. Become educated about toxins in your food and water and how the government is regularly spraying our own skies with toxic metals. More importantly learn how to detoxify from these poisons being put in our food, our water and our skies. Learn how toxin and metals are regularly inserted into vaccines because the vaccine industry is completely immune to law suits and anyone who challenges them is an "anti-vaxxer", is ridiculed, is threatened with loss of their job or ends up dead. Then educate yourself once and for all about the lies behind the global warming hoax which starts with understanding exactly how CO2 works, how historic global temperatures were calculated in Al Gore's "Inconvenient Truth". Learn more about the original history of the global warming movement. Learn also about how the "Koch brothers" are tools posing as opponents to the global warming movement (while funding it) in order to inspire more people into siding with global warming. When you put it all together you'll see right through this new wave of state propaganda very easily. The sooner you do this, the sooner you become immune to government scaremongering. This should be the goal of every person and is a powerful reminder of the importance of turning government and the mainstream media off in order to stay mentally healthy. If you agree please share this message.